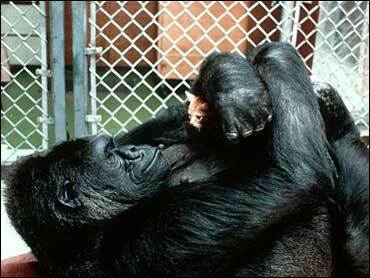 WOODSIDE, Calif. -- Koko, the gorilla who mastered sign language, has died. The Gorilla Foundation says the 46-year-old western lowland gorilla died in her sleep at the foundation's preserve in California's Santa Cruz mountains on Tuesday. Koko was born at the San Francisco Zoo in 1971, and Dr. Francine Patterson began teaching the gorilla sign language that became part of a Stanford University project in 1974. The foundation says Koko's capacity for language and empathy opened the minds and hearts of millions. Koko appeared in many documentaries and twice in National Geographic. The gorilla's 1978 cover featured a photo that the animal had taken of itself in a mirror. In 2016, Koko and Flea, bassist for the Red Hot Chili Peppers, teamed up in an Instagram video.